D Godoy, G Bonadeo, H Peralta. Fight bite injuries. The Internet Journal of Emergency Medicine. 2002 Volume 1 Number 2. 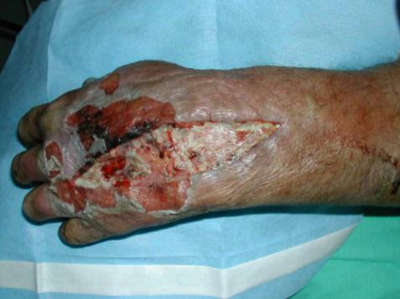 All human bite wounds are potentially serious and at risk of catastrophic complications. But the particular type called fight bite is very common and often treated as minor injury, because underestimation of the lesion without the recognition that the joint capsule, extensor tendon or deep fascial may be damaged and contaminated with oral bacteria. Significant complications may arise after inappropriate initial treatment or late presentation. We present a case and a review of clinical presentation, diagnostic techniques and management options that may be applied by emergency doctors. The objective of this paper is to show a case of clenched fist and the importance in emergency of a common pathology that can be underestimated with catastrophic consequences. The lesion in much more serious than it initially appears. The patient hit another individual in the mouth region with the fist. This blunt impact on the patient produces soft tissue and bone injury. The teeth of the victim generate a small (3-5 mm) laceration over the dorsal metacarpophalangeal (MCP) joint and appears innocuous to the patient and the unwary doctor. These injuries create an inoculation of oral bacteria in a close space, and can involve soft tissue, joint space and tendon sheath. Due to prompt resolution, is very frequent that this kind of lesion to be underestimated by the patient, arising complication affecting the local functionality and systemic damage. 65 years old male, arrived to consult after 5 days of a street fight with tachycardia, hypotension, fever, confuse (Glasgow scale 13/15). 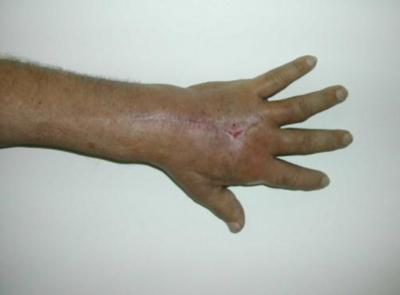 At ED, clinical observation secretion through a small injury on the dorsal aspect of the proximal phalanx of 3 finger in left hand; increase of local temperature, slow capillary reflux, edema on the forearm, flictenas on dorsum of hand and forearm, exacerbated pain at finger mobilization, and decrease in distal sensibility (median nerve territory), no crepitation was detected. The patient report that was assisted in an other institution after the injury and discarted bone fractures with x-rays and ordered to use ice and pervinox cleaning for 2 days. The patient was admitted for new and complete evaluation with present diagnosis hand and forearm compartmental syndrome secondary to hand infection. New x-rays were taken (discarting fractures, foreign bodies, or gas in soft tissues), laboratory with 22000 white cell count. As soon as clinical evaluation was finished, antitetanic immunization was performed, and patient transferred to surgery room. Pressure in dorsal compartment was (20mm Hg) and in palmar compartment (42 mm Hg).. A Henry approach was performed, decompressing palmar spaces including carpal tunnel, observing edema in muscles and venous congestion, with no infection signs. Dorsal approach on hand and forearm was done, purulent material (about 120 ml) drained from preretinacular space, carefully cleaning was performed, leaving the wound open and material was sent to culture and pathology. 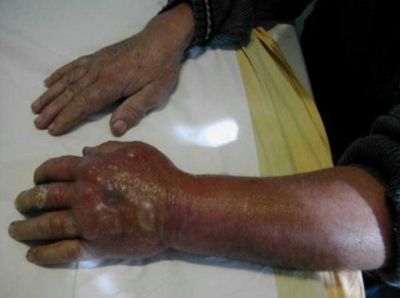 Empiric treatment started with 1 g amoxicillin – sulbactan endovenous each 6 hours. The upper limb splinted and remained elevated. Sensibility and capillary reflux improve immediately surgery, and systemic symptoms disappear after 6 hours. A beta hemolytic streptococcus was isolated. At 24/48 and 72 hours new toilettes were performed, with daily evaluation. The patient was discharged after a week of treatment, and started hand rehabilitation, and occupational therapy. After 3 weeks the wound was closed by second intention and mobility was acceptable. There is a frequent presentation, but it is difficult to establish the true incidence because many patients do not seek treatment due to prompt resolution of the bite injury, embarrassment, fear to legal repercussions, giving inadequate information about the origin of the lesion providing misleading histories.(1,2,3,4). Many studies reported a incidence peaks in the ages 10 to 34 years and a male predominated injury (4-1)(2,3,4). The patient can seek for medical advice as soon as hurt, and the injury may pass underestimated as a simple cut. 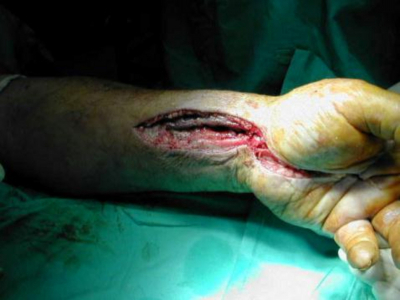 The common presentation in once the infection is started involving the skin (cellulitis), deep soft tissue, extensor tendon and its sheath and even the MCP joint. All these joint infections are very aggressive and rapidly destructive.(2,4,6,8,9). There are 3 important reasons for this so aggressive progression: a) the MCP joint and the tendon are limited vascularizated structures, and have limited ability to fight infections. b) a high concentration of pathogenic microorganisms in the human mouth. Human saliva contains about 50 species of bacteria with a concentration of 1 X 108 per milliliter) the MCP space is an anareobic environment encouraging rapid bacterial growth(2,4,5,6,7,9). The most common organisms in hand infections from human bites are S. Auresa and Streptococcus, but Eikenella corodens is seen in up to 30% of fight bites (this may be due to Eikenella is more prevalent on tooth scrapings and the inoculation come from them)(2,4,5,6,7,9). Symptoms may vary based on time elapsed before presentation. Typically, patients arrive to consult after 5 to 7 days with a fight bite, infected wound (open cut), swelling, erythema, pain, and limited range of motion, increase of local temperature. Additionally systemic affection may be present like: fever, lymphadenopathy and toxic syndrome signs.(2,6,7,8). 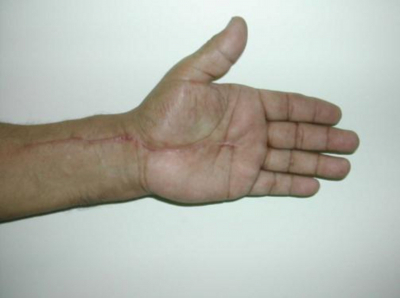 In the earlier presentation the injury may look like an abrasion o superficial lacerations over the dorsal aspect of the hand, with mild or moderate cellulites. The emergency practitioner should treat the lesion soon and carefully (2,4,7). In patients with suspicion of potential fight bite wounds, radiographs should be consider. Metacarpal head and proximal phalanx fracture may occur, and tooth fragments remaining in the wound or joint may be detected (2,7,8). Debate does not exist in the late presentation and clinically obvious infection for the general practitioner. Patient should be admitted for surgery procedure with open irrigation, debridement. Tissue is taken for culture and le wounds are left open to heal by secondary intention. Tetanus prophylaxis is given and posterior splinting. Intravenous antibioticotherapy (amoxacillin plus clavulanic acid 1 g each 6 hours) is started immediately(2,4,7,9). Depending on the cultures patients can be discharged with specific antibiotics treatment. More controversy is in the treatment of a non infected closed fist injuries. Carefully evaluation should be given to these wounds. Every laceration on the skin by the MCP joint must be suspected to be a fight bite. The hand must examined through the full range of motion, with particular attention to the closed fist position, as damage in deep structures may not be evident. After local toilette and exclusion of tendon or joint involvement with negative radiographs for foreign bodies, wound must be left for secondary healing and prophylactic antibiotics given (amoxacillin plus clavulanic acid 1 g each 6 hours). 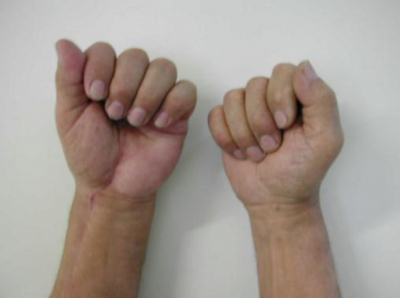 The patient must contact a hand surgeon within the next 48 hours for evolution control.(2,4,8,9). Cosmetic deformities lost of function, residual pain, osteomyelitis, necrotizing fascitis, septic shock and death. 1. Codigo penal de la nacion. 2. Bunzli W.F., Wright D.H., Hoang A.T. et al: Current managemente of human bites. Pharmacoterapy 1998.18, 227-34. 3. Lindsey D., Christopher M, Hollenbach J. et al: Natural course of human bite wounds: incidence of infection and complications in 434 bites and 803 lacerations in the same group of patients. J. Trauma 1987. 27: 45-8. 4. Mann R.J., Hoffeld T.A.m Farmer C.B: Human bites to the hand: twenty years of experience. J. Hand Surg. 1977. 2: 97-104. 5. Kelly I.P., Cunney R.J., Smyth E.G. Et al. : Teh management of humna bite injuries of the hand. Injury 1996. 27: 481-84. 6. Mennen U, Howells C.J. : Human fight bite wounds of the hand. J. Hand Surg. Br. 1991. 16:431-5. 7. Chadev A.P., Jukhtin V.I., Butkevich A.T. Et al. : Treatment of infected clench fist human bite wounds in the area of metacarpophalangeal joints. J. Hand Surg. Am 1996. 21: 299-303. 8. Perron A.D., Miller M.D., Brady W.J. : Orthopedic pitfalls in the ED: fight bite. American J. Of Emergency Med. 2002. Vol 20 N2. 9. Abrams R.A., Botte M.J.: Hand Infections: Treatment reommendations for specific types. J. Am. Acad. Orthop. Surg 1996. 4: 219-30.